The Associate of Science in Veterinary Technology Program recently hosted a Pet Exam and Vaccine Clinic for dogs and cats. This low-cost clinic was held in Stanbridge College’s world class Veterinary Technology Skills Lab where students had the opportunity to complete various treatments and procedures on over 20 live animals under the supervision of the Stanbridge College Veterinary Technology program faculty. Stanbridge Students were able to practice hands-on skills in venipuncture, subcutaneous injections, physical assessment of an animal, flea control treatment, microchipping, gland expression, vital sign collection and ear exams and cleanings. 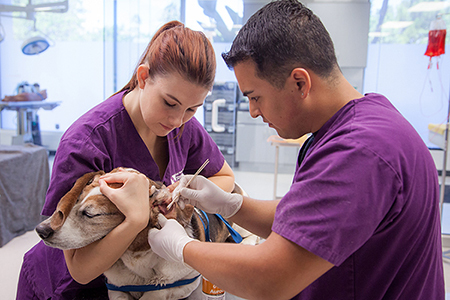 Stanbridge College Veterinary Technology students perform ear cleaning on a basset hound. During this clinic, Stanbridge College partnered with the Basset Hound Rescue of Southern California to provide free veterinary services to various hounds currently in the rescue’s care. Stanbridge students strengthened both their skills and confidence in a fast-paced veterinary hospital setting and found great value in providing quality care and services to the animals they treated. Javier Soch, a current Veterinary Technology student stated, “the interaction between classmates” was his favorite part about the clinic, students were able to see “what they are capable of and how they can help each other” to accomplish a common goal. For more information about the Veterinary Technology program at Stanbridge, please visit www.stanbridge.edu or email learn@stanbridge.edu.